Well done to South of Scotland Car Club Members , Willie Keaning , Warren & Kelsey Gillespie who travelled the long journey down to Herefordshire to compete in rd 2 of the British Autotest Championship and all come away with great results. A cloud covered Foxley Estate just West of Hereford, the scene of a former American Airforce Hospital, welcomed competitors to the second round of the championship on Sunday. With four test sites set out, each to be attempted four times, the competition promised to be a lot hotter than the weather, and so it proved to be after the first round. Malcolm Livingston (Lindsay Special) held a slender 1 second lead over the sports car of Willie Keaning (Striker) who in turn was 1 second up on Chris Chapman (Striker). 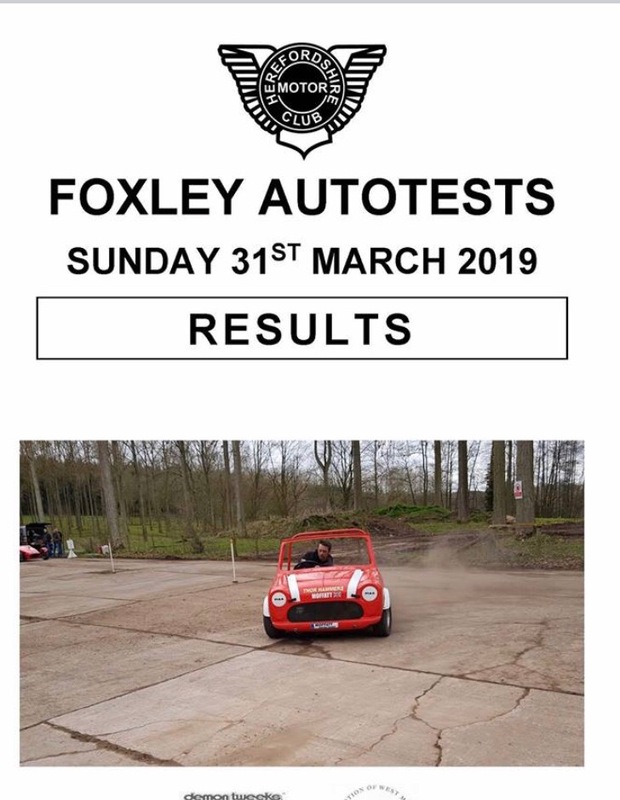 Such was the pace of the first round that the two Mini Specials of Alastair Moffatt and Dave Mosey had already suffered a maximum score with broken driveshafts, but that just suited Paul Fobister in his revitalised Fobby Special, lying just a second behind John Moffatt (Westfield). The second round would hold further troubles. Malcolm Livingston’s run came to a dramatic end when his engine dropped a valve, ending the day, and then Chris Chapman’s Striker broke the gearbox, but that would get changed during lunchtime to enable him to continue. The lunchtime scoreboard had Alastair Moffatt (Mini Special) holding a 3 second lead over Willie Keaning (Striker) who was revelling in the conditions, and he a further 2 seconds lead over Paul Fobister (Fobby Special). John Moffatt (Westfield) was a further 4 seconds back, and he had a relatively comfortable 12 second margin over Dave Mosey (Mini Special) and Chris Chapman (Striker). In the saloon car class, Warren Gillespie (Nova) held a 100 second lead over his daughter Kelsey, whilst Charlie Lower was all alone in the Mini class. 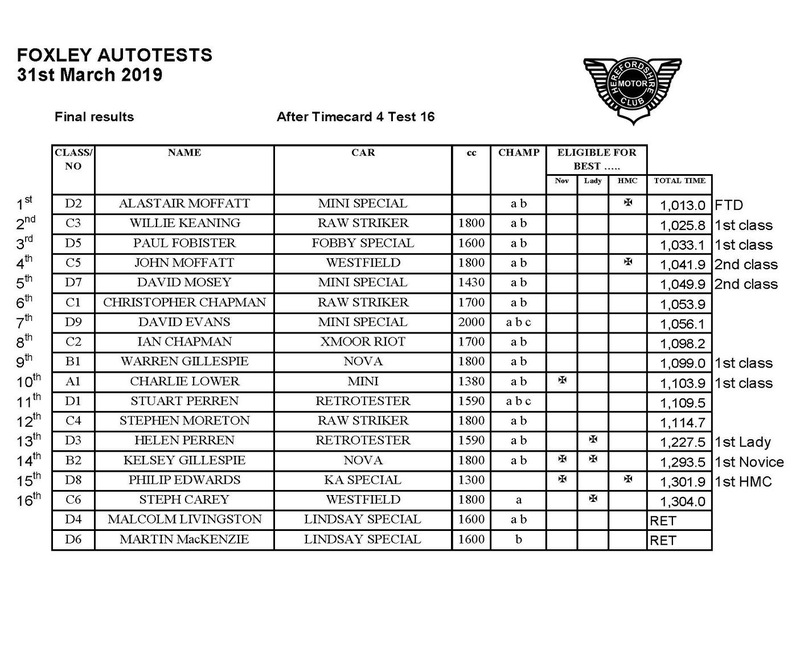 The 8 afternoon tests passed off without any further incidents, just Willie Keaning and John Moffatt collecting a single penalty each. With only two weeks until the next round, Malcolm Livingston is faced with an expensive engine rebuild, whist Chris Chapman needs to look at a gearbox rebuild and an engine ignition problem. Steve Morten needs a rear axle rebuild, having broken a half shaft on the last but two test, but Willie Keaning and Paul Fobister will be delighted to continue where they left off at Hereford.